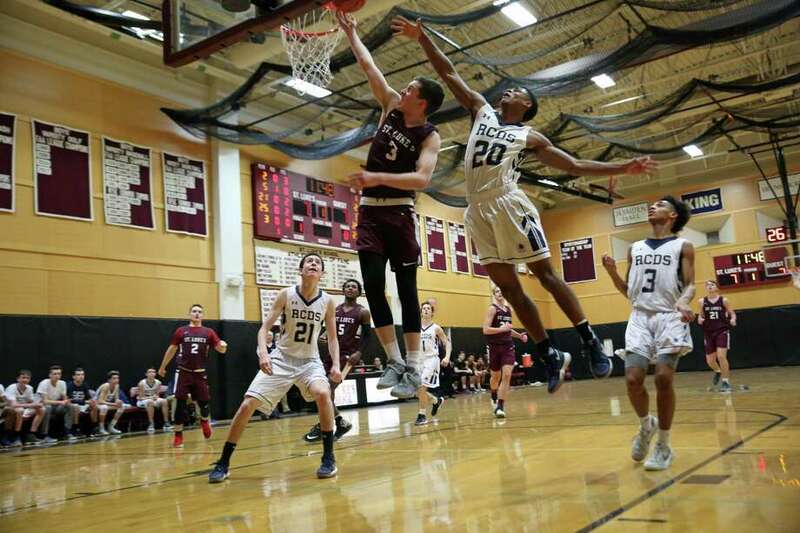 Jackson Ryan of Darien goes up for a layup against Rye Country Day School. St. Luke's winter teams enjoyed another successful season and 16 student-athletes were recognized for their efforts in the postseason accolades. Girls varsity basketball had another stellar season on the court as they were crowned FAA League and tournament champions for the third straight year. The team finished the season with a perfect 9-0 record in FAA league play and an overall record of 25-3. Senior captains Maya Klein and McKenna Frank, as well as Caroline Lau ‘22, received All FAA and NEPSAC All-Star honors and Janelle Johnson ‘20 received and FAA Honorable mention. Boys varsity basketball also had another excellent campaign as they moved up to Class B for the first time. The Storm finished as runners-up in both the FAA league and tournament championship finishing the season with an overall record of 17-7 (12-2 in FAA). Jonas Harper ‘18 and Jackson Ryan ‘18 were selected as the All-league FAA team and Andrew Varoli ‘18 received an honorable mention. Class B NEPSAC All-Star team honors are yet to be announced. The St. Luke’s varsity hockey team battled through a number of injuries to finish the season with an overall record of 7-5-1. The puck squad was defeated in the FAA semi-final match up by overall winners Harvey. Senior captain Will Frossell ‘18 was named in the FAA All-League team for the second straight year and CJ Woodberry ‘19 received an honorable mention. The varsity ski team had a superb season on the slopes with Andrew Kurth ‘18 and Phoebe Kurth ‘20 enjoying numerous top-ten finishes. The two siblings narrowly missed out on qualifying for Team CT and remain on standby as alternates. They were both recognized for their efforts as both received All-State Honors. Boys varsity squash enjoyed a very productive campaign with a number of excellent wins along the way and solid performances in both Nationals and the New England Tournament. Dennis Polyakov ‘18 and Thomas Bailey ‘22 were selected as FAA All-League players and senior captain Logan Diliberto received an honorable mention for their outstanding contributions. Girls varsity squash had a difficult start to the year but continued to show great character throughout the season. They were rewarded for their continuous hard work with some excellent victories including one to celebrate this year’s only senior Caroline Nevin. Caroline Pellegrino ‘20 was recognized for her fine season as an FAA All-League nominee and Nevin received an FAA honorable mention.